I’m happy to report that System 7.5 and Mac OS 7.6 are the real deal. These versions of the Mac OS make connecting to and communicating with modern computers easy and convenient. They allow access to nearly every 68k-compatible application, and 7.5.3 and 7.5.5 are freely and legally available to boot! In this article, I’ll be talking about System 7.5 a lot, but I really mean “the various versions of System 7.5 and Mac OS 7.6” If you’re a fan of 7.6, please feel free to substitute it wherever you read System 7.5. Continuing the evolution from Blue to Pink, System 7.5 includes several Macintosh firsts. Apple Guide extends the Macintosh ease-of-use even further. Picking up where Balloon Help left off, Apple Guide actually works with you, step by step, to help perform tasks and solve problems. If you get lost, Apple Guide can even circle in red the onscreen area where attention is required. Adding Apple Guide support to applications is easy with the Apple Guide Authoring Kit. Desktop Printing makes handling an overload of many networked printers easy! Every printer you choose to use appears as an icon on the desktop. Monitoring the progress of print jobs is accomplished quite intuitively by double-clicking the printer’s icon. Choosing a default printer is as simple as selecting it and choosing “Default Printer” from the Printing menu that will appear. This new menu also contains many options to fine-tune printer settings. Say good-bye to that awful PrintMonitor! Extensions Manager helps automate the sometimes-tiresome job of INIT and cdev (extensions and control panels) management. Opening this Control Panel presents you with an organized list of all INITs, cdevs, “scri”s, and several other types of System Folder inhabitants. Each item has a checkbox to simply toggle it on or off, and custom groupings can be saved. For example, one set may contain everything for day-to-day use while another minimizes extensions for gaming or video capture. Gerbils shows of QuickDraw 3D. When it’s time for fun, you’ll find a new Jigsaw Puzzle that’s customizable with your own favorite picture. Eric’s Ultimate Solitaire Sampler finally puts Windows 3.1’s Solitaire in its grave, and if you have a Power Mac, the QuickDraw 3D-based Gerbils is a real classic. Apple had gone on a buying spree. Many new System 7.5 features were already familiar as must-have shareware or freeware titles for System 7.0 and 7.1. With WindowShade, any window can be collapsed to its title bar by double-clicking with an optional modifier key. Loved SuperClock under System 7? It’s returned for Round 2 and now lives inside the improved Date and Time control panel. The organizational power of the Apple Menu comes alive when Apple Menu Options enables recent-file tracking and folder navigation through pop-out menus. And when it comes time to find that all-important file, Ziff-Davis Computing’s advanced Find File program (with built-in file contents search!) flies onto your screen simply by pressing Command-F.
For quick access to many of the Mac’s important “switches”, you’ll love the Control Strip. Previously available only on PowerBooks, now you’ll find it sliding across the desktop of all sorts of Macs! QuickTime 2.5 (the last free version of the venerable multimedia powerhouse) is greatly improved. This version is faster, supports more video codecs, is more expandable, and has greater still-image capabilities than previous versions. Macintosh Easy Open lets the Finder make somewhat informed guesses about which app created an unknown document, a great convenience. An improved Sound Manager enables more fun in your games and more pizzazz in your multimedia. It is no longer necessary to restart to change monitor resolution. Built-in CD-ROM support saves the trouble of installing driver software for Apple’s CD-ROM drives. Open Transport networking is far more modern than MacTCP, faster, and supports more doodads to make network applications roar. ColorSync helps to make sure that what you see really is what you get. Macintosh Drag and Drop brings the copy-and-paste feature to new heights of intuitiveness. …must come down, and System 7.5 and related versions aren’t all perfection. Continuing with the negative as well as positive trends, System 7.5 was the largest and slowest release ever, in its day. However, constraining your System Folder to a reasonable size will ensure that the speed penalty is minimized. System 7.5.5 is fairly responsive on any Macintosh with at least a 16 MHz processor, and it’s tolerable (but notably sluggish) on the 8 MHz Mac Plus, SE, and Classic. The other side of this same coin is System 7.5’s increased RAM requirements. An out-of-the box installation of 7.5.3 consumes 2,598 KB on my Macintosh LC, and testing reveals that a system with all the important updates swells to 4,096 KB. That’s 4 MB just to boot the operating system! That RAM hunger is the largest reason I don’t recommend System 7.5 for RAM-limited Macs. 30-40 MB is a reasonable System Folder. 200 MB is not. Guess how small mine is. On the bright side, with any Mac that can take 4 or more 30-pin SIMMs – or even just one 72-pin SIMM – this RAM-chomping behavior is nothing to worry about. With 32 MB free after booting a 36 MB Performa 460, you’ll never even notice how much RAM 7.5 is taking up. Since relatively large RAM upgrades like these are available quite cheaply (and sometimes even for free), System 7.5’s RAM footprint isn’t as fearsome as it might have seemed 20 years ago. System 7.5 was the last system software release made while Apple still believed it could ship Copland in a reasonable timeframe. As such, it’s a virtual dumping ground for technologies that never grew up. OpenDoc was Apple’s plan to get us all hooked on document-centric computing. The idea was that instead of needing to dance back and forth between behemoth applications to produce a document, we could simply open the document in a “container” application. Once the document was open, we’d have the freedom to bring in specialized software “parts” to accomplish tasks such as photo editing and spelling-checking. OpenDoc was one of the core foundations of what was to become Copland, and part of its allure was that it was an open cross-platform standard. Apple had partnered with various other high-tech big kids to get OpenDoc to be the Next Big Thing. OS/2’s implementation was supposed to be a grand day out. The timing couldn’t have been worse. We all know what happened to OS/2, the writing was on the wall about Copland, and very few outside the OpenDoc Partnership ever adopted OpenDoc technology. Today it’s remembered mostly as the extension that’s required to get CyberDog to run. QuickDraw GX was another revolutionary technology that just didn’t make it. GX was to be the successor to QuickDraw and formed a complete replacement from printing to display, color-matching, and font management. QuickDraw GX provided many improvements for the user, such as a more helpful print dialog; smarter, better-looking type; and improved ColorSync integration. In addition, it had several features that were very cutting-edge among personal computers of the day: When using GX-enabled fonts in a GX-savvy application, its typehandling capability was exceptional. Context-sensitive glyphs knew which version of each letter to show for best appearance. Also, its native ability to create coordinate transformations using a 3×3 transformation matrix on the fly was a first in its class. Several factors conspired against QuickDraw GX and destroyed it before its day in the sun. First, to take advantage of QuickDraw GX’s amazing printing features, each printer driver needed to be rewritten from scratch. Few third-party hardware vendors expended this effort, so many end-users were left without GX printing. Worse, few major software packages were updated to use any of QuickDraw GX’s advanced printing, typography, or drawing capabilities. Even if you had GX printer drivers, it was hard to find a program to use that power. Finally, QuickDraw GX was slated to be the graphics engine behind Copland. NeXTstep, the heir to Copland’s throne, included its own advanced drawing suite, Display PostScript. Why keep developing it when its replacement was known to be coming soon? Unlike OpenDoc, parts of QuickDraw GX lived on. Stripped of its printing features, QuickDraw GX shipped with Mac OS 8 and was fused into standard QuickDraw with Mac OS 8.6 and higher. All These Numbers Flying Around! System 7.5 (Sept. 1994): The original release was preinstalled on many computers. System 7.5.1 (Mar. 1995): Available by updating System 7.5 with System Update 1.0. System 7.5.2 (Aug. 1995): An interim release that was installed on the Power Mac 7500, 8500, 9500, and first-generation PowerPC PowerBooks. System 7.5.3 (Jan. 1996): The result of updating 7.5.2 with System Update 2.0. System 7.5.3 Revision 2 (May 1996): The most confusing version. Product of updating 7.5.2 or 7.5.3 with System Update 2.0 Revision 2. Also available on CD-ROM or by download from Apple. System 7.5.4: This is the shy version. Released for but a day or two, 7.5.4 was pulled due to a serious bug affecting Power Mac 5400 and 6400 models using IRTalk. Though I haven’t used it yet, I don’t see how a Power Mac bug would affect 68k Mac users. Excellent for the nerdiest among us if you can find it! System 7.5.5 (Sep. 1996): The pinnacle of System 7.5 evolution. Includes all fixes from earlier patches. Updater still available from Apple. Last Mac OS to support 1986 Mac Plus and more recent 68000-based Macs. Mac OS 7.6 (Jan. 1997): Update to System 7.5.5 to get Apple in line with new Mac OS release plan of one new CD version every year. Mac OS 7.6.1 (Apr. 1997): Update to Mac OS 7.6. Provides bug fixes and support for the new PCI Power Macs (4400, 6500, 5500, 7300, 8600, 9600) and the PowerBook 3400. Mac OS 7.6 deserves some special mention. The most obvious difference is the name change; this was for the Mac clone manufacturers, who weren’t making Macintoshes but “Mac OS Computers”. Basically, Mac OS 7.6 is System 7.5.5 with a few software updates packaged on CD-ROM. In addition to improvements in performance. The system’s memory allocation scheme for some of its more frequently used shared libraries has been streamlined to take advantage of file mapping when virtual memory is turned on. A new “umbrella” installer, which walks the user through a safer, saner installation process. This includes disk-integrity checking and fewer restarts. Lack of support for 24-bit addressing and thus lack of support for applications that require it. Also no support for 68000-based Macs, which are 24-bit only. New Installer. While the installation process is a lot better, it has a major bug: The custom install option doesn’t work. Spend 10 minutes selecting just the right components for your Mac? Doesn’t matter; you’re getting the Easy Install anyway. Default installation of OpenDoc Essentials Kit. This might have been great when Apple was trying to get everyone excited about OpenDoc, but now nobody wants it besides CyberDog users. Most of us could do without. Cost: Apple still hasn’t let go of Mac OS 7.6. It is not freely available for download; if you want it, you have to pay for it. All that aside, there is one really good reason to recommend Mac OS 7.6 over System 7.5: Large volume HFS support. If your Macintosh supports SCSI Manager 4.3 (PowerPC and 68040-based systems only) and you have a hard disk that’s larger than 4 GB, System 7.6 will let you make huge partitions. That in and of itself could be worth the price of entry for some users. I’d also say that 7.6 is better than 7.5 for PowerPC Macs because of the aforementioned performance improvements. Mac OS 7.6 is a fine system, but given its close similarity to System 7.5.5 and the fact that it costs money, I can’t recommend paying for a copy unless you’ve got a Power Mac or need support for partitions larger than 4 GB. 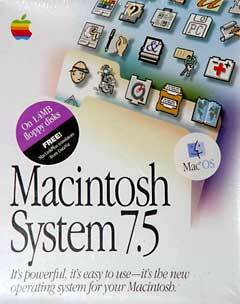 System 7.5.5 and Mac OS 7.6 are great system versions for vintage Macs that have what it takes to use them. Luckily, “what it takes” is really not much more than “at least 16 MB of RAM and a 16 MHz CPU”. System 7.5.3 and the 7.5.5 updater are freely downloadable from Apple. After all the necessary updates are applied, it can file-share (both ways!) with Mac OS X 10.4 Tiger, print to TCP/IP-based networked printers, read modern Windows CD-R discs, and generally do everything most people require from a computer. Mac OS 7.6, while not free, is just as good as System 7.5.5 – and better in a few respects. It is recommended over and above 7.5.5 for those with Power Macs and for 68040 users with hard drives bigger than a couple of dozen megabytes. [You need 70 MB just to install it.] If you have a copy, don’t be afraid to use it! My personal website has a more technical article series about the somewhat involved procedure necessary to bring System 7.5.5 fully up-to-date (see Installing a “Modern” System 7.5.5). Most of the information is applicable to Mac OS 7.6 as well. If you’re not a System 7.5 or 7.6 user, there’s no time like the present to consider becoming one! Installing a “Modern” System 7.5.5: Enhance TCP/IP Connectivity and use every 68k Application!